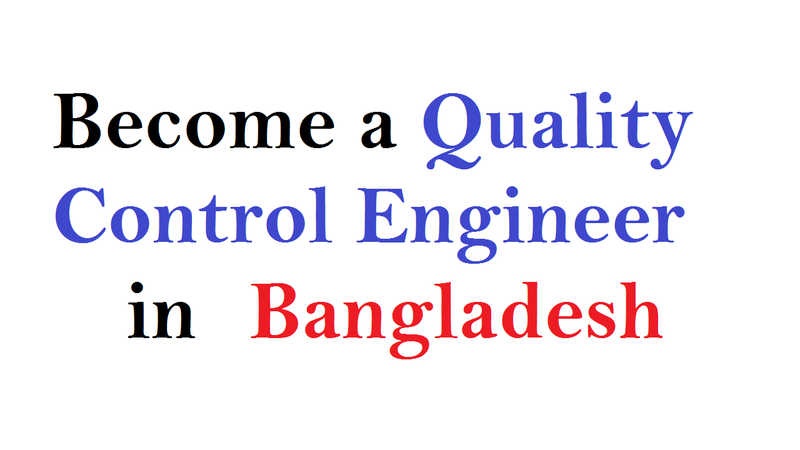 A quality control engineer in Bangladesh is the person who gets a challenging and lucrative career path with practical and scientific backgrounds. He or she is also known as the quality engineer who evaluates products to ensure they meet a company’s specifications. Because individuals must meet certain requirements that include a college degree, several years of experience and a certification, becoming a quality control engineer takes time. Almost any organization that produces a product for public consumption including retail product manufacturing, biochemical engineering and software development, quality control engineers work for. Also, quality control engineers ensure that a manufacturer’s final product meets all industry standards as they are close to quality assurance engineers, who monitor the production process itself. In the context of Bangladesh as a lot of garment factories, the job of a quality control engineer has good prospects. As many companies are making vigorous efforts that they can make their manufacturing processes more efficient, lower costs, and improve productivity and quality. So, it should be good opportunities in the food and beverage industries, pharmaceutical firms, electronics companies, and chemical companies for quality control engineers and technicians. Also, they can get employed in industries that are using robotics equipment or in the aerospace, biomedical, bioengineering, environmental controls, and transportation industries. It will decrease the number of quality control personnel needed for these areas as there are lowered rates of manufacturing in the automotive and defense industries. Because of the increased use of automated equipment that tests and inspects parts during production operations, declines in employment in some industries may occur. Apart from these, the employment outlook for quality control engineers and technicians depends on general economic conditions. If we talk about the degree of a quality control engineer in Bangladesh, it’s a Bachelor of Science in Civil Engineering. Although it’s a five years course degree, some colleges and universities are offering trimester, so you can take the course for only about four years. As long as you have a strong desire or willingness and yes anyone can become a Quality Engineer even though you’re not a Civil Engineer. But, you must have a degree if you want to be a quality control engineer. For example, we know one person in the neighboring company who is an Architect but, in his current position, he is a QA/QC Engineer though. On the other hand, if we talk about a quality control engineer then it’s ranged between $49,056 and $70,000 annually as of the last year. As you need to obtain a bachelor’s degree in an engineering field, a bachelor’s degree can take up to four years to complete and should include courses in economics, calculus, introductory engineering and other courses that are related engineering methods. Although some go on to complete a 2-year master’s degree program, a quality control engineer usually enters the workforce with a bachelor’s degree in engineering. Those who have completed laboratory work as part of their degree program, potential employers may show a preference for them. So, you should take high school classes in mathematics physical sciences, physics, and chemistry to prepare for this career. Also, you should be an expert with mechanical drawing, and computer courses if you want to be perfect in this career. With good communication and problem-solving skills, a quality control engineer should be team players. Also, it may be required for some positions with proficiency in specialized instrument calibration and laboratory work in a biotechnology setting. Some need to meet special requirements that apply only within the industry employing them as there are no licensing or certification requirements designed specifically for quality control engineers or technicians. In order to indicate that they have achieved a certain level of expertise, many quality control engineers and technicians pursue voluntary certification from professional organizations. Although quality control technicians, they begin their work under the direct and constant supervision of an experienced technician or engineer. They are given assignments with greater responsibilities as they gain experience or additional education. Also, with additional education, they can become quality control engineers. But, if you talk about the promotion then it usually depends on additional training as well as job performance. Those who obtain the additional training they have greater chances for advancement opportunities. Although a quality control engineer may have limited opportunities to advance within their companies, they have the opportunity to change jobs or companies to pursue more challenging or higher paying positions because quality control engineers work in all areas of industry. Along with leadership abilities, quality control engineers need scientific and mathematical aptitudes and strong interpersonal skills. As quality control engineers must weigh all the factors influencing the quality and determine procedures, good judgment is also needed. Also, they should not only feel comfortable using the language and symbols of mathematics and science but should do well in mathematics, science, and other technical subjects. Including the ability to use hand tools, they should have good eyesight and good manual skills.